ShowCASe talent following the One Layer Wishing Challenge! sentiment work really well for this card. as thinking outside the box. One layer doesn't have to be square! 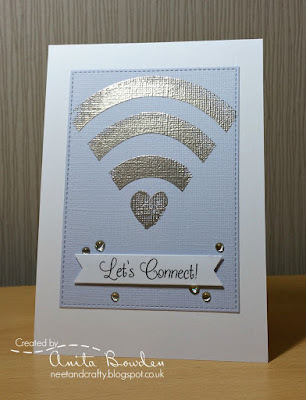 Super masking has created a really striking, effective card. Leaving the bunny unshaded adds to the effect. to your blogs and we hope you'll wear it with pride! but a new one will start tomorrow at 8am BST... Hoper you'll join us then. What comes to mind with this word? we couldn't live without it these days although sometimes it's very hard to live with it! Give your imagination free rein! I have a computer generated one layer card for this week's challenge. added the sentiment in problem secretary font. The card is linen textured, tent folded. of a mobile phone, with the bits and bobs I had around me! and a hole punch, fitting the smaller black circle onto the silver piece. The microphone at the top was made with the letter i from a Cuttlebug's Babyface alphabet. The message is also from little alpha die-cuts and the sentiment is computer generated! I have to admit this was a mega struggle but in the end I decided to go with 'tech' speak! Down with the young'uns using 'hash-tags'! with 'smile' and 'celebrate' from the brand new set being released today. manipulated into a curve. The three curves were embossed in Wow! Platinum EP. Clearly Besotted's 'Tag Along' set. A few glazed gems were added to accent. technology ideas. Have fun and don't forget to keep your creations clean and simple! There were some magnificent entries for our Green & Gold challenge and narrowing down the winners was a very difficult job, so this week we have four showcased cards. Rema's interlocking hearts look fabulous and the stitched frame and crisp lines make this such a sophisticated card. 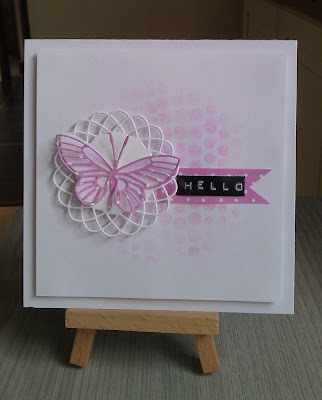 Tenia's creation uses wonderful layered elements whilst remaining CAS. We loved the dotted paper leaves. 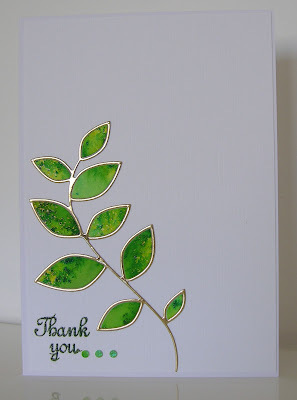 The die-cut leaves cut from Brushos on watercolour card look incredible outlined in gold on this super CAS creation. 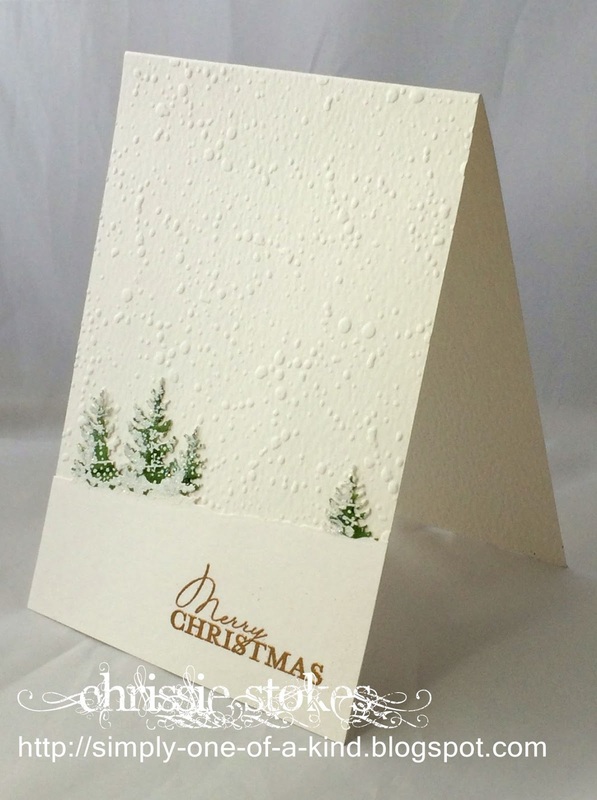 The offset notepad die-cut panels look fantastic with the scribbled tree image and metallic embossed detailing. 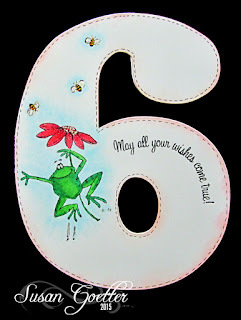 We loved this classy card. 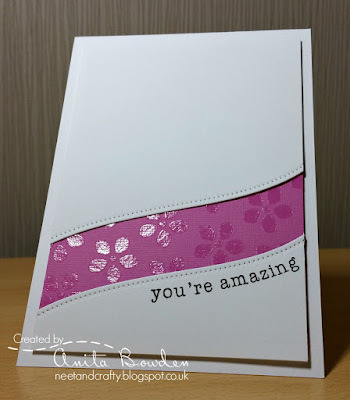 We are so thrilled to have so many wonderful crafters who contribute fabulous cards to our challenges each week, we're only sorry we can't showcase them all! Please take the showcase badge from the page at the top to add to your blogs with our grateful thanks! There's just a little time left to join in this week's challenge but a new one will start tomorrow at 8am BST... join us then. 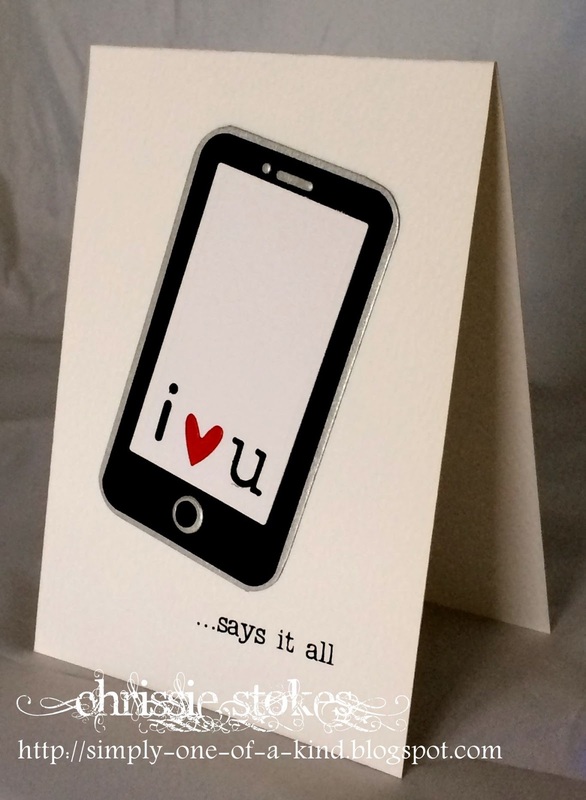 You don't necessarily have to have that word on your card, but the sentiment or design should reflect the theme! 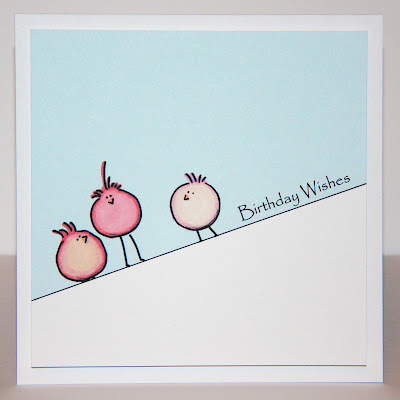 Greetings cards are all about sending good wishes to someone, so it shouldn't cause too many problems... the one layer element is another matter of course! 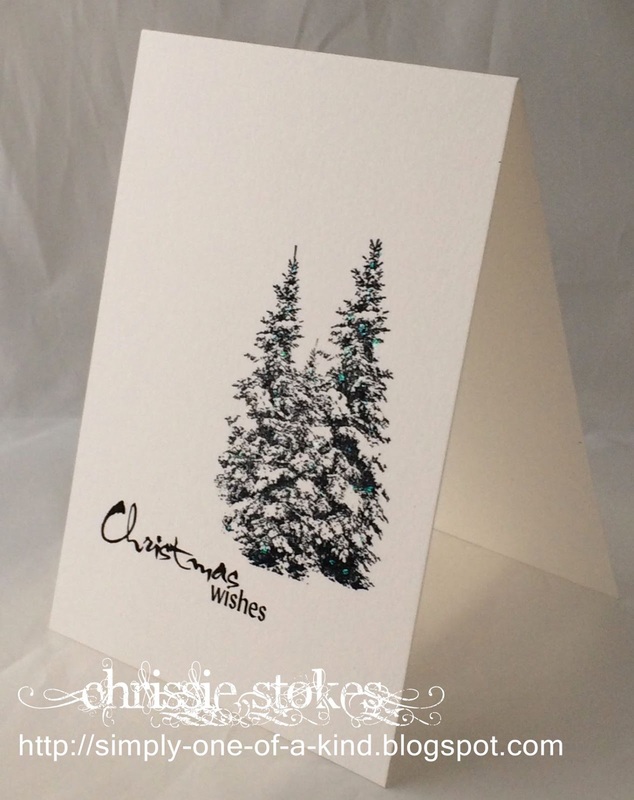 DO remember that white space and try not to add too many embellishments! I stamped and masked the images from Clearly Besotted's Love Quotes II stamp set using Archival ink in Jet Black. I then coloured the images with some Zig Clean Color Real Brush Pens and water. 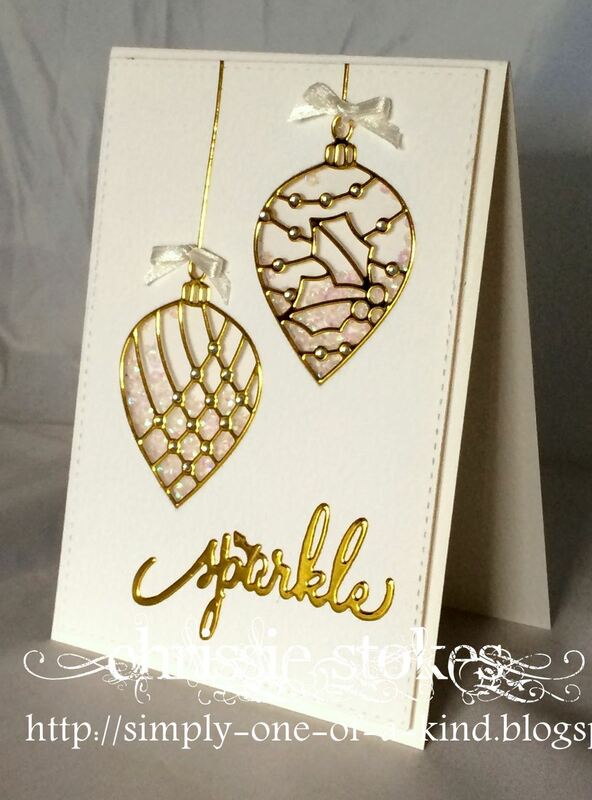 The sentiment is from the same set and I finished off with a sprinkling of Doodlebug sequins. 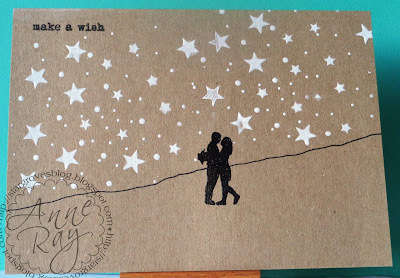 My kraft card has embossing paste stars stencilled on from a Memory Box stencil, a Unity sentiment and a Clarity couple stamped and heat embossed. Hillside added with a Pigma pen. This is the simplest of cards. 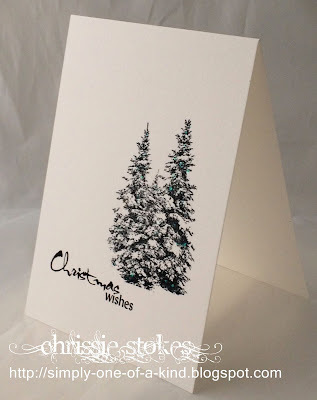 A computer generated sentiment and Winter Pines stamp by Deep Red. There are some twinkles on the trees, for which I dabbed a little Stickles here and there, but sadly this doesn't really show up on the photograph. This may well be one of those stand-by type designs which I'll be able to produce quickly should I be short of a few cards at the last minute. The fonts are VNI-HL Thuphap and Lydian BT. I decided to try out a rustic-type scene with cups and mugs using the 'Warm Wishes'. set from Clearly Besotted and sentiment from their In The Frame set. 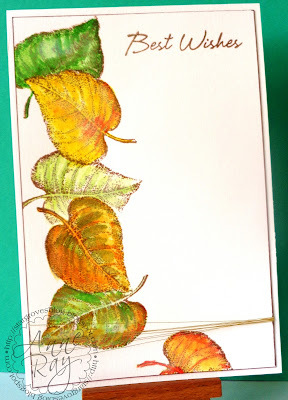 using Hero Arts white EP before water-colouring with distress inks. To finish ... some extra dots to the cups using a gel pen for more detail! Lucky dip - sprays and mists challenge! selecting our winners extremely difficult! challenge theme has taken you and we appreciate your contributions every week. over the grassy images. Beautiful colours and a super CAS design! of spray mist to follow the theme of the week! work brilliantly together with the teeniest spritzing and stencilling to pull it all together! your ShowCASe badge can be found on the tab at the top of the blog. morning with details of the next Less is More challenge. Less is More prize winner for August! and our lucky winner is Liz of Crafty Sunflower! popping up in the comment lists which we love to see! and hope you enjoy your prize. Please contact us by email for details of how to claim it. Green and Gold colour challenge. It's a New Month and we have a new Sponsor! She carries an amazing range of products so if you haven't yet paid her a visit, we would urge you to do so, you won't be disappointed! We would like you to keep any additional colours to neutral tones and make it obvious which two colours are this week's chosen shades. with lots of white space! 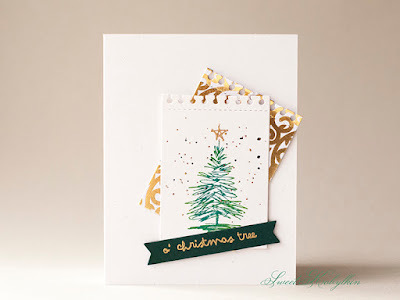 Using various green distress inks blended onto watercolour card in an 'ombre-type' fashion I then heat embossing the Christmas tree and sentiment from Uniko: Rustic Christmas with WOW gold metallic sparkle embossing powder. The birds are from the same Uniko set, stamped in gold delicata and for added detail I die-cut my panel using MFT Die-namics inside out stitched rectangle stax! On some white cardstock and using the Background Builders Vines Winter Additions set by Uniko I stamped all the elements separately, first using two green inks and then once dry I stamped the rest in VersaMark and heat embossed with Wow! gold embossing powder. 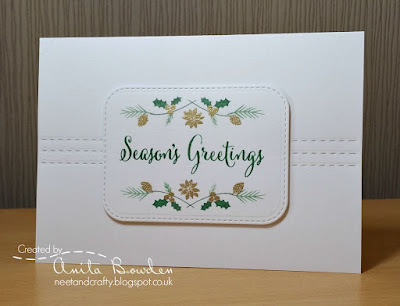 I then stamped the sentiment from Simply Said Christmas, also by Uniko, in green pigment ink and heat embossed with clear embossing powder. 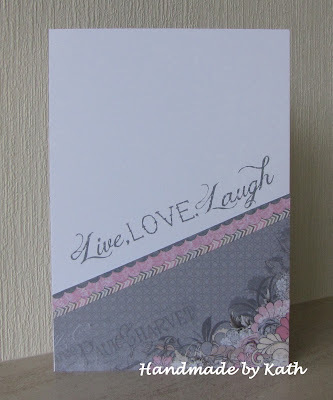 I die cut the images with a Stitched Rounded Rectangle by MFT. 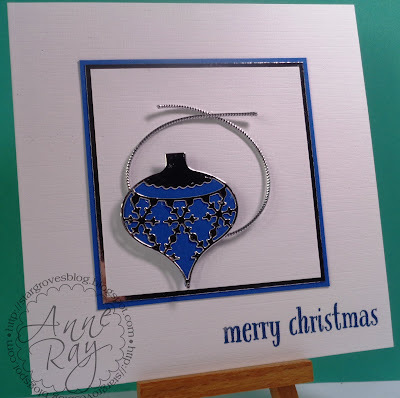 I used a Paper Smooches die called Stitched three times to create the stitched rows on the card base and then popped the image panel up on 3D foam in the centre. 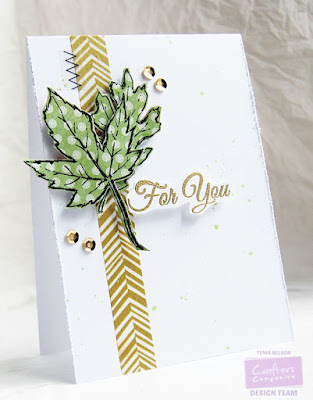 Autumnal greens and golds, this is an Inkylicious stamp, masked and repeated, coloured with an assortment of Distress Inks. There is some very fine gold embroidery thread wrapped around the panel, the sentiment is Hero Arts. 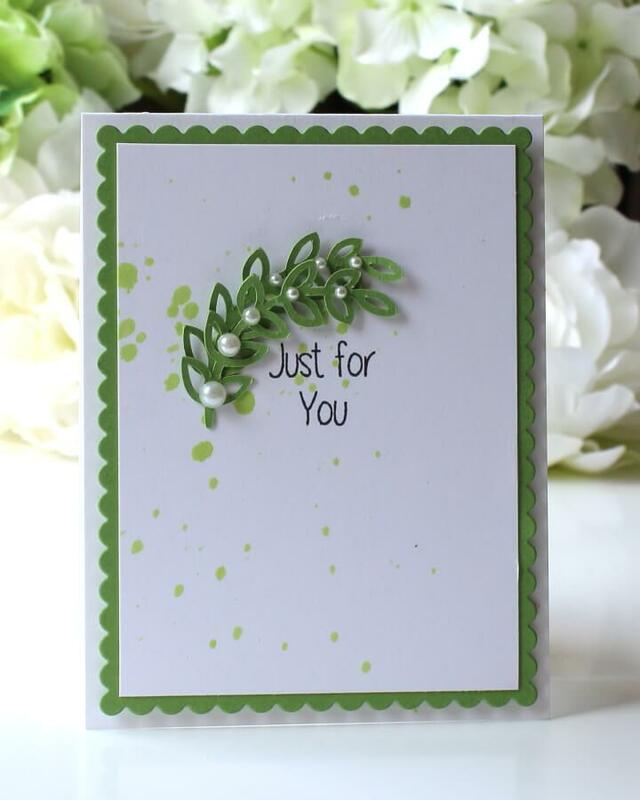 This is an Impression Obsession die-cut, randomly coloured with a deep green alcohol pen, then stamped with a splatty stamp and heat embossed in white. A little Glamour Dust was added for extra sparkle. 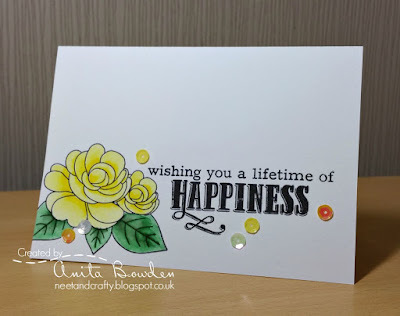 The sentiment is from Stampin' Up (retired) and embossed in WOW Pale Gold EP. The background is embossed with a Sheena Douglass folder. Remember Green and Gold and little else! You may remember that we had a sketch for our challenge last week and what a lot of wonderful interpretations of it there were. Choosing our showcase entries was a real pleasure and here they are! 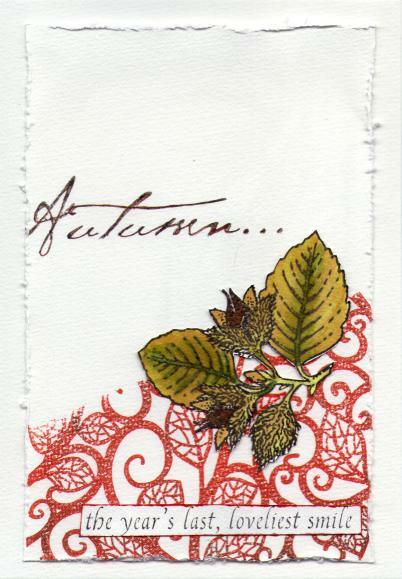 Love the torn edges of the main panel and the beautiful leaves. We couldn't resist these little beauties...guaranteed to bring a smile! 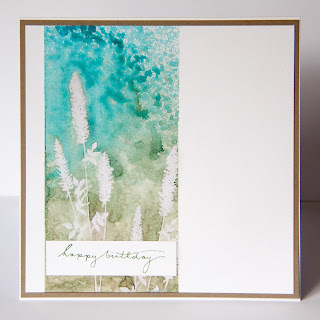 Kath used this delicate DP and matched it beautifully with the sentiment in this terrific CAS card! DO take the ShowCASe badge from the page at the top ladies and we hope you will display the, on your blogs with pride. There's just a little time left to enter this week's mist/spray challenge, but we hope to see you tomorrow for another new colour challenge!